William Shakespeare comes up to me, his fur so curly it hides the exact shape of his canine body. He gives me a nuzzle, flipping my hand onto the top of his nose for a stroke. I push back the curls hanging down from his brow and stare into his wide anthropomorphic eyes. There is so much emotion within a dog, so many feelings and complexities. I wonder what it feels like to mentally be a dog. I wonder if they feel the same language barriers; undoubtedly, there is palpable frustration when a dog wants to get inside and there is no one to let them in. I spread the airy tie-dyed blanket on the stiff dried grass, tussling with the cool breeze for the blanket to lay unhindered. William licks my ankles. It is uncharacteristically cool for a mid-afternoon in Assisi, although the top of the mountain tends to be cooler than the city itself. It had rained for a spell the day before, the lapping rain wrapping the air in a shroud of pleasant coolness which carried over into this afternoon. I am alone. Blissfully alone. Wrapped in my fleecy patagonia sweater and black jeans. The gang–a total of 14 now–had bounced their way down the mountain into Assisi to examine the ancient roman structures of amphitheaters, circuses, baths, temples, and houses which were speckled through Assisi. I had stayed behind in order to meet deadlines for summer courses that I had neglected when the group of us spent the weekend in Florence. I had overestimated the amount of time and effort it would take for me to meet these deadlines–blissfully a full 7 hours later than my American counterparts thanks to the European timezone–and was finished with what needed to be done two hours after the gang left. So I had the next wonderful magical five hours to myself. The breeze tickles my face and whispers through my hair as I lay down on the blanket, the slope of the hill perfect against my back. I’m not used to having curly hair during the summer. The humidity of a Kansas summer usually causes the curls to frizz and bloat into one swarm, but Europe is a different story. William stretches out beside me, resting his chin against my thigh. He takes a deep breath and let it out as a sigh. I do the same. Fuzzy green mountains surround me from all perspectives, the atmospheric effect casting me into a trance of aesthetic. The grass under me is dry and course from many afternoons of the sun, but the softness of my blanket and the incline of the hill counteract any discomfort. A short line of ants scatters their way across my shins. William licks a few away and the rest got the picture; my mighty Warrior canine is not interested in making friends. I spend four of my hours finishing Margaret Atwood’s The Year of the Flood. This is one of my favorite things to do, to spend an exuberant amount of time in a beautiful setting reading intense mind-colorful books. Having a beer to accompany the aesthetic is even better, but this afternoon was too perfect to complain. The last hour I spend dangling in a chair hammock at the edge of the garden, again looking out at the hill. Just thinking. Breathing. I love the group of people here at Humanities Springs. Our three-story mountain chateau is breathtaking and filled with buzzing activity and exploration, which excites me and stimulates intellect. I love sitting at the table with Valerie, writing out my name in the Chinese characters that she has sketched for me. I love making Italian espresso in the kitchen while Laura buzzes around preparing dinner and telling me stories about her Iranian sister-in-law. I love dangling my feet off the verandah with Maria, talking about running and passion and watching the stars. But there is something about breathing at the edge of the garden at the edge of the world that is irreplaceable. 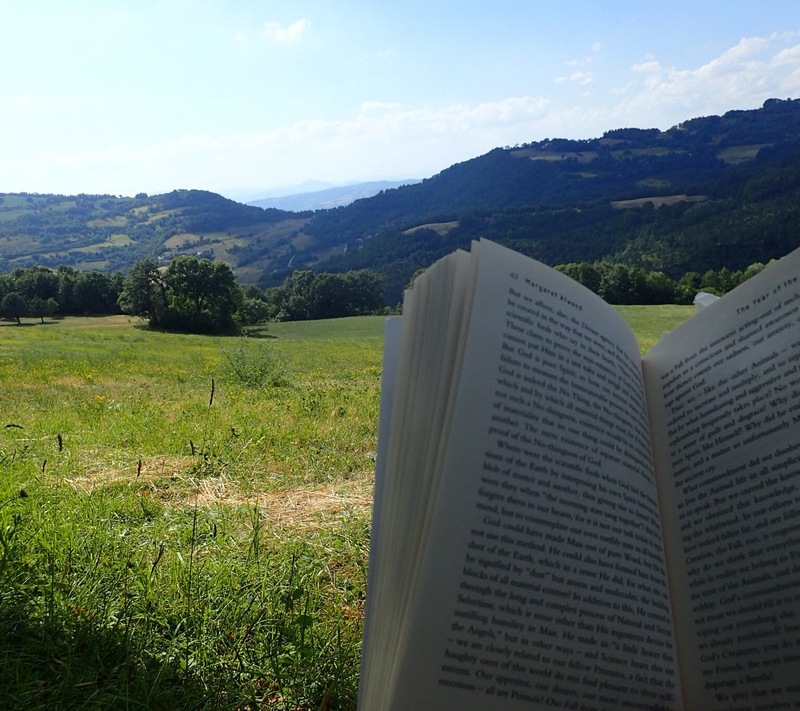 I would say this doesn’t happen often enough, that I wish I could spend hours upon hours laying on the hillsides reading. But then it wouldn’t feel like this afternoon. It has to be set apart, holy. Special. The exception to chaos. This kind of chaos is beautiful. The rush to learn and absorb information about Italian verb conjugations, roman street plans, a history of St. Francis of Assisi; Jenny pulling books upon books down from the shelves of the library for us, Tanya dancing around pointing out different pages for research. But, if I’m being honest with you, it can be overwhelming. The times laid out for rest and relaxation are the my times times for summer coursework and post-semester essay-writings. If that is done for the day, than it is for chores and life admin. It feels as if there are so many things running around in my mind, that sometimes I forget to breathe and I forget what day it is and where I am and why I am learning what I am learning in the first place. But this afternoon I sit here, swinging in the chair hammock at the edge of the garden at the edge of the world, my lungs again full of air. When I get into states of complaining and self-pity–”woe is me, I have no time to do anything that I want and there is no time to be a human”–my father sits me down and reminds me that we all have the exact same amount of time in a day. The day is spent in a series of choices; yes I have things that are expected of me to do, but I also have things I do not have to do and I control those. Therefore, who am I to complain about how little time I have? Who am I to act as if the choices I make are not my responsibility? My complaints add nothing to those around me. More often than not, those who have to receive my self-pity are busier and more stressed than I, and the weight of my complaints add to theirs. I swing and breath and be, the soles of my feet reaching towards the edge of the world. There is a palpable difference between complaints dripping in self-pity–”It’s fine, whatever, I just have a million things to do and no one seems to be helping me and I don’t know why everyone expects these things from me”–and expressing feelings–”I feel overwhelmed and burdened by this and this and I wish that I could do more of this because it makes me feel lighter”. So what I don’t want you to hear is that I believe all utterances of any kind of negativity should be burned at the stake along with the speaker. I would take a world of negative realism far over a world of superficial positivity. I believe that reality is our perception of reality, and a perception founded on self-pity is detrimental to not only our own goodwill and mindset but of those also around us. I am an optimist, but only because I choose for my reality to be optimistic. We are made up of choices. Some that are made for us but a great many that we make ourselves.